... it doesn't mean that cities are irrelevant. In fact, given that they are now seen as the drivers of economic growth in many advanced industrial economies, we really should be aware of how things are connected. 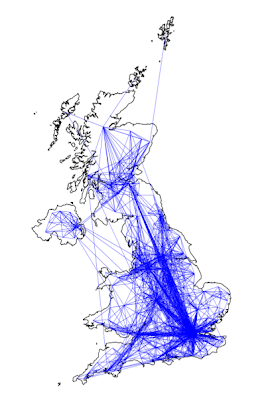 When you look at the major migration patterns in the UK, these kinds of connections are more obvious. 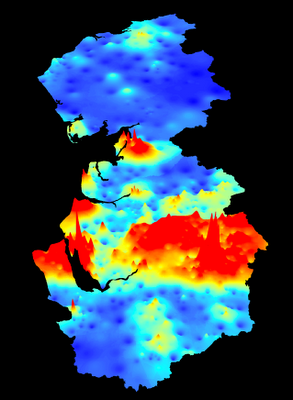 When you look at the patterns in even more detail, in this 3D image I created for migration patterns in the North West of England (high in-migration areas in red, out-migration areas in blue), we start to get a better understanding of the ways in which cities import people (mainly students and young people). However, they do export families who generally tend to rely on urban areas for a living but don't want to live there... But that's another matter. So, everything is connected to everything else. This is exactly what Waldo Tobler's First Law of Geography states and I am a firm believer in it. Nothing should be studied in isolation (especially in planning) and that's why much of my work includes a spatially dynamic element. The relative importance of this connectivity may vary, but it is invariably important. We need to see the big picture if we are to understand what's going on in our own back yard, so to speak. From Data to Knowledge using Google Maps?